These were the men of Force K6. Force K6 were needed in France because the British Army had completely switched to motorised transport. The slogan was ‘not a horse in the force’, but the prospect of mud-filled trenches where vehicles would become bogged down forced the planners to think again, and the call went out to the empire. 1723 men (nearly all ‘Punjabi Mussulmans’) of the RIASC and 2000 mules assembled in Punjab in November 1939. With mule drivers, NCOs, tradesmen, dhobis and sweepers – even the occasional maulvi or Imam – each company resembled an all-male Punjabi village, transplanted to France, where they arrived on December 26, 1939. The companies were soon divided up among the BEF, with the 25th and 32nd companies posted to the main British area around Lille. For the next five months they enjoyed and endured the so-called ‘Phoney War’: French, British and German troops looking at each other across barbed wire and waiting for the ‘real’ war to start. Their routine of grooming and feeding the mules and delivering supplies was broken up by visits from VIPs like the Duke of Gloucester. This routine was rudely interrupted on May 10, 1940, when the Germans attacked France and the Low Countries. Sitzkrieg had become Blitzkrieg, and Force K6 were soon heading for the channel ports. The 25th company marched cross-country from their base just north of Lille, arriving at Teteghem, on the outskirts of Dunkirk, on May 27. Like all the other companies, they were ordered to abandon their mules and their equipment, but in a section in his memoir entitled ‘The Myth of Dunkirk’, Major Muhammad Akbar Khan reports that on May 20, the day they left Lille, a staff officer said: ‘tell my men to throw away their arms and . . . try to reach the beaches of Dunkirk immediately’ in small groups or individually, and that if unarmed and intercepted by Nazi troops ‘they should surrender’. Akbar conferred with his junior officers and told them ‘as a Muslim I refused to be guided by fears’, and resolved to keep the company together, leave the carts behind and put the sick and disabled, including their Maulvi, Mohammed Arif, on mules. So they arrived on the beaches during the early hours of May 28. With streams of refugees on the road, Luftwaffe planes bombing and strafing, and Panzers not very far away, the sense of panic must have been hard to avoid. What is clear is that the 25th company held its nerve, stayed together, and that Akbar marched at their head along the beach from the Fort-de-Dunes to the Eastern Mole. They embarked in small groups by 2am on Wednesday May 29, the third day of Operation Dynamo (the evacuation from the beaches), and reached Dover without human loss at 9am. Like their fellows in the BEF, the relief was palpable; Akbar reports them singing and dancing on the quayside at Dover. The men of K6, reinforced the following year by three more companies, spent the next three and a half years in Britain. They were stationed in remote parts of the country, training with British infantry brigades. As ‘exotic’ foreigners in turbans, they were invited to 61 parades throughout the country, from Penzance in Cornwall to Dornoch in the Scottish Highlands. They were photographed many times and appeared in Pathé newsreels. 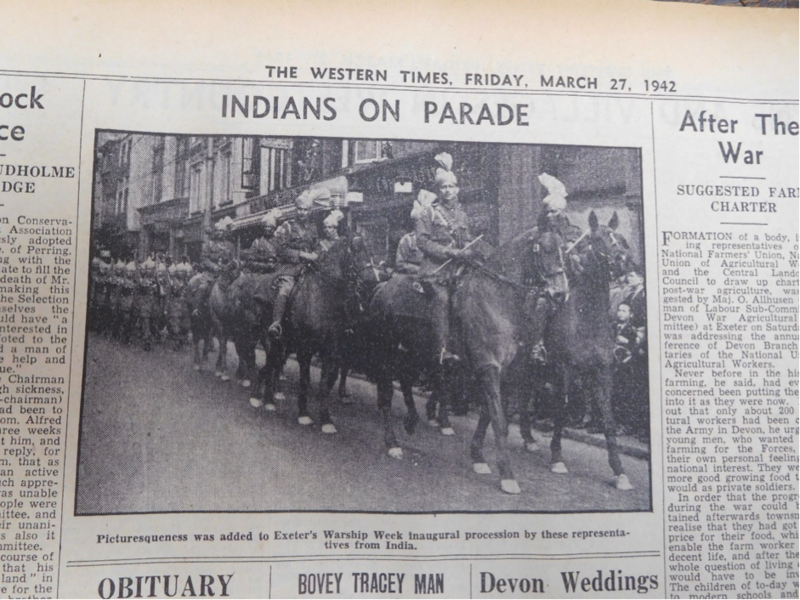 ‘Indians on Parade,’ Western Times (local Exeter newspaper), March 27, 1942. 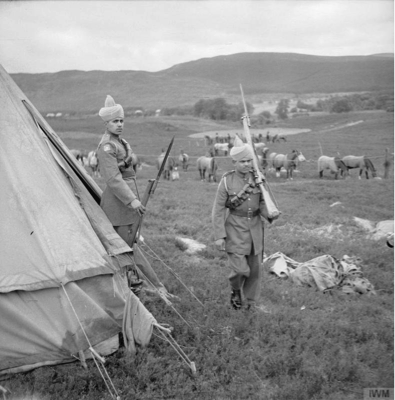 Lt Lockeyear, K6 men in the Scottish Highlands near Aviemore, July 1942. Imperial War Museum H21632. 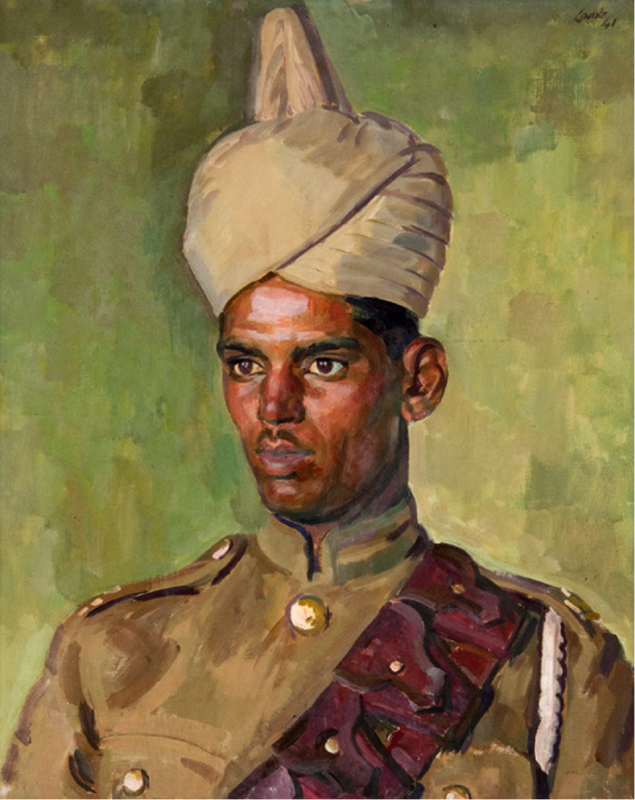 Major Akbar and Driver Abdul Ghani, in turn, were painted by an official war artist, and the paintings exhibited at the National Gallery. Henry Lamb, Portrait of Driver Abdul Ghani, 1941. Courtesy of the Kelvingrove Museum, Glasgow. One soap company, Sunlight, even used their images as inspiration for its advertisements. And yet these soldiers are practically unknown now in Britain, and forgotten in their native Punjab. The reasons for that forgetting are complex, and vary depending on where you are in the world. In the UK, the Second World War is well remembered, partly as a result of a series of blockbusting movies like Nolan’s that largely leave out the contributions from across the empire. In Pakistan and India, however, the war is commonly viewed as simply part of the runup to Partition and Independence in 1947. Similarly, according to mainstream Pakistani history, the main event of 1940 was not Dunkirk or the Battle of Britain, but the Lahore Resolution, when a concrete idea of Pakistan emerged and Mohamed Ali Jinnah became seen as the ‘sole spokesman’. The academic Omer Salim Khan remarks that the trauma of 1947 ‘wiped out everything else… ‘47 is a cut-off point’ and people have ‘put up walls inside their memories’. But this excess of forgetting also clearly reflects a sense of national priorities. This was not a national war for the people of Pakistan, in the way that subsequent wars with China and India were, and has warranted much less remembrance. The excess of British memory and of forgetting that surrounds the whole period is remarkable when viewed from a South Asian perspective. What Noakes and Pattinson have called the ‘two world wars and one world cup’ approach to British history exists strongly on the football terraces, but also stretches beyond that into wider discourse. Within that, there is a remarkable ‘collective national amnesia’ about the Indian Army in general. Wendy Webster, in her recent book Mixing It suggests that the warm welcome experienced by foreigners for the duration very quickly evaporated after the cessation of hostilities in 1945, when competition for housing was extreme and those who had been seen as allies now became ‘immigrants’. Although no members of K6 migrated back to the UK immediately, they were part of this group of forgotten allies. So Christopher Nolan’s omission is merely a part of a longer, wider, bigger series of omissions. Force K6 was left out of Nolan’s film because it was not aiming to cover all the participants; it was an American film made by a British director with an Anglo-American audience in mind. Both Nolan and the film’s historical advisor, Josh Levine, acknowledge the movie’s importance in educating British people about Dunkirk, and Levine at least is now aware of the omission of ‘the Indians . . . which became the great furore afterwards’. Historians and journalists also deserve their share of the blame for this. 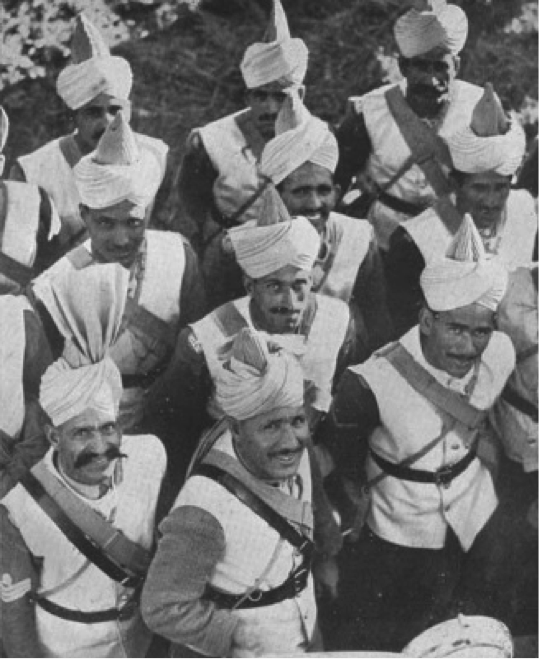 Although recent academic scholarship has started to address the vital role of the empire in the Second World War, popular history still leaves K6 and the 2.5 million of the Indian Army out, and this omission helped create the film’s omission: a cycle of forgetting that continues today. generations of British schoolchildren, including me, sat through history lessons about World War II and never heard about the connection to Asia. 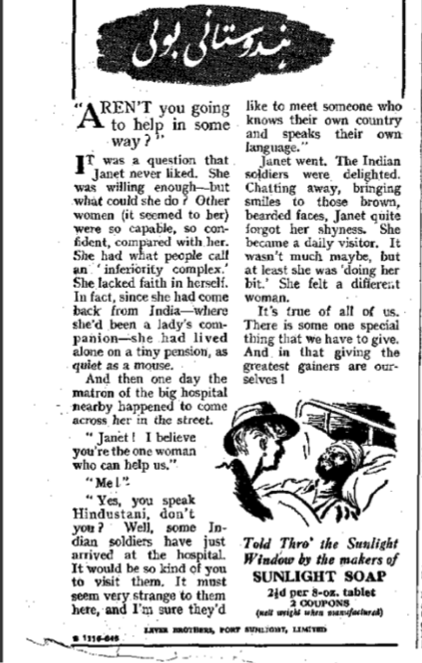 British South Asians have only tentatively started to see their own place in this ‘British’ story. Perhaps a South Asian filmmaker will step forward to offset the excess of forgetting that has engulfed the men of Force K6, and allow them to take their rightful place in the story of Dunkirk and of the twentieth century. See, for example Yasmin Khan, ‘Dunkirk, the War and the Amnesia of Empire,’ New York Times (Aug. 2, 2017); Diya Gupta, ‘Christopher Nolan’s Dunkirk and the Cultural Memory of a Global War,’ News 18 (Aug. 21, 2017); Robert Fisk, ‘When You Watch Dunkirk, Remember that It’s a Whitewashed Version Which Ignores the Bravery of Blacks and Muslim Soldiers,’ Independent (Aug. 3, 2017); Sunny Singh, ‘Why the Lack of Indian and African Faces in Dunkirk Matters,’ Guardian (Aug. 1, 2017); Dipankar De Sarkar, ‘The Further Adventures of Dunkirk’s Pakistani Indian Soldiers,’ Live Mint (July 28, 2017); John Broich, ‘What’s Fact and What’s Fiction in Dunkirk,’ Slate (July 20, 2017). M Akbar Khan, The History of the Army Service Corps Volume III (Karachi: Islamic Military Arts Association, n.d.), p.166. Commanding Officer, ‘War Diary, 25 Animal Transport Company,’ June 1940, The National Archives, Kew, England, WO 167/1438. Yasmin Khan, The Raj at War: A People’s History of India’s Second World War (London, 2015), p.320. Omer Salim Khan, Interview with Omer Salim Khan, interview by Ghee Bowman, March 12, 2018. Lucy Noakes and Juliette Pattinson, eds., British Cultural Memory and the Second World War (London: Bloomsbury Academic, 2014), p.1. Wendy Webster, Mixing It: Diversity in World War Two Britain (OUP, 2018), p.19. Joshua Levine, Dunkirk: The History behind the Major Motion Picture (London: William Collins, 2017), p.14. Joshua Levine, ‘Dunkirk – The History Behind The Motion Picture’ (Lecture, April 26, 2018). See, for example, Ashley Jackson, The British Empire and the Second World War (London, 2006); Srinath Raghavan, India’s War: World War II and the Making of Modern South Asia (New York: Basic Books, 2016); Christopher A. Bayly and Tim Harper, Forgotten Armies: Britain’s Asian Empire & War with Japan (London: Penguin, 2005); Khan, The Raj at War; Gajendra Singh, The Testimonies of Indian Soldiers and the Two World Wars: Between Self and Sepoy (London, 2014). Khan, ‘Dunkirk, the War and the Amnesia of the Empire’. Can someone now deal with the part the Indian troops played at Gallipoli -if you haven’t already done so. I learnt more about the composition of the British army in World War 2 from computer war games than any other source (I believe there were Indian divisions in R T Smith’s Desert Rats). There is often an attention to detail, occasionally bordering on the obsessive, in such games, and gaps and omissions are more obvious. For example, the Hearts of Iron series of games has detailed global maps and historical generals and ministers from many countries. I expect it would be controversial to use war games to teach history, and some degrees of bias of various kinds will exist in them. Nevertheless, if they are generally more accurate than popular movies, then perhaps that comparison is appropriately shaming. Interesting idea – thanks Sleeping Dog. I’ve not played such computer games myself. I wonder if the attention to detail which you mention is only on military matters, or also on social and cultural things? I’m interested in both fields: what the men were doing as a job, what they wore and their equipment, but also what they ate, who they met and how they thought (which is almost impossible to fathom). From my experience, I played abstract strategy and tactical games from the 1980s which reduced military formations to counters, and had very few distinguishing attributes. The have been much later first-person war-games which both put you in the action and supply some biographical detail (in Call of Duty campaigns, for example, the character of the soldier you play might periodically introduce each deployment with a letter sent home). You can see what individual soldiers look like, there are unit descriptions, and some detail on rulers, ministers and commanders. You get a sense of geography, climate, technology, architecture, flora and fauna, religion, economics and trade; and there are occasional historical facts which are perhaps sometimes designed to challenge preconceptions. However, all of this is subordinate to the fighting and empire-building, and there is no realistic individual experience. I think one of the sustained biases in computer war games that I have encountered is the over-concentration on certain politically-favoured theatres and conflicts. For example, a WW1 game could concentrate solely on the trench warfare theatre in France and Belgium. Civilian casualties and war crimes seem almost entirely omitted in games I’ve played. The representation of different ethnic or national groups is often ahistorically skewed. Oddly, the most inclusive games I have played were the science fiction UFO Enemy Unknown series, where soldiers were recruited from nations round the world and could be female or male, have full names and diverse complexions. Very few war-games I have played were in any serious way anti-war (This War of Mine is an exception). I would certainly like to play a game which had the features you describe, but I have not found one yet. Very thought provoking.I avoided ” Dunkirk” the blockbuster as I knew it would be biased towards the glorification of war and the Empire! How sad to miss the opportunity to address our gratitude to all the brave forces who came to our rescue and their enormous sacrifice.